Various free and paid reputation management tools are available on web for real time monitoring but which one shows you the most complete and relevant results? It’s an unsolved mystery to decode which we picked out top three tools, Google Alerts, Trackur, Rankur and compared their results in real time. After studying the negative results of Liberty travel in our last post, we have selected ‘YMT Vacations’, a travel based website to examine data & analytics of these three popular tools in perspective of digital reputation. If we talk about the sources, Google Alerts clearly showed us maximum results for YMT including images, videos, new sites & social media, local listings but somehow missed the actual links where a thread/comment appeared on a social networking site. Instead of showing actual post/update, it gave us the profile or page link where a mention belongs in. On the other hand, Trackur & Rankur gave actual results of social media mention, comments & threads too. 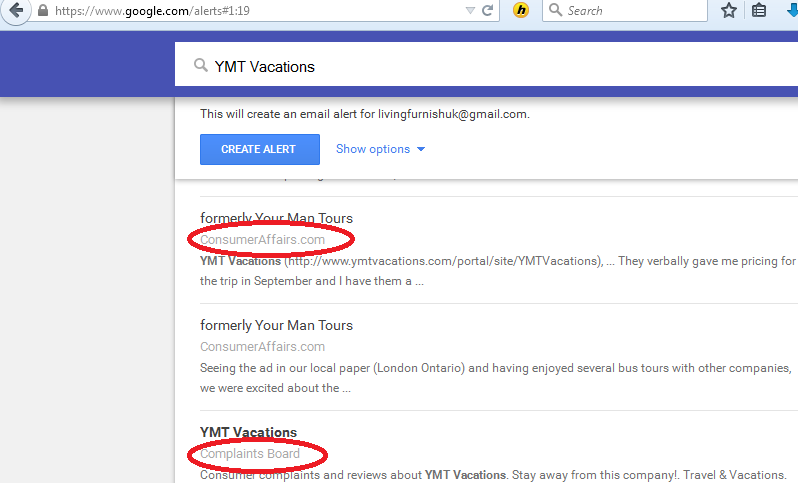 But, ironically these two tools did not show any listings or review sites in their results for YMT Vacations. Sites like Yelp, TripAdvisor and ConsumerAffairs are seemingly the biggest harm to one’s online reputation today and not seeing them in Trackur and Rankur was a bit shocking to us. You can see below that ConsumerAffairs & Complaint Board links appear on the top of Google Alerts results while the same go missing from Trackur’s and Rankur’s list. 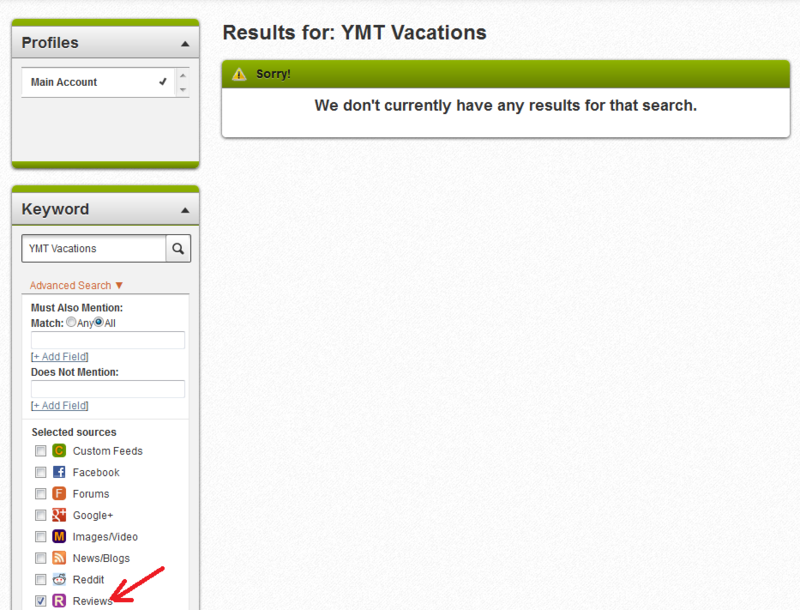 Here is what Trackur showed us when we tried to look for reviews based results for YMT Vacations. Conclusion: Since no tool gives complete results, it’s preferable to use all three tools in order to fetch results from all sources. To maintain digital reputation, you can neither afford to miss reviews/listings site links nor the social media comments. When we talk about the most recent results, Rankur is the only tool that offers real time results for keyword and mention tracking. Though it’s strange but we concluded it after constantly observing YMT results for almost 2-5 days, so it’s hard to disbelieve either. See the snapshots of March 29 below, in which Rankur shows up-to-date results but Google Alerts & Trackur are stuck on March 27 only. Conclusion: Both tools have a downside except Rankur if we talk about the newest results. Rankur leads the way in showing freshest/latest results while Google alerts and Trackur trail behind. Rankur shows more recent results, so it’s reasonable to see it among the high results offering tools too. Google Alerts pulls reviews and listing results too, due to which it is also ahead of Trackur in the race of quantity. Google Alerts misses results related to exact link of social media comments and updates, so it lags behind Rankur in quantity. 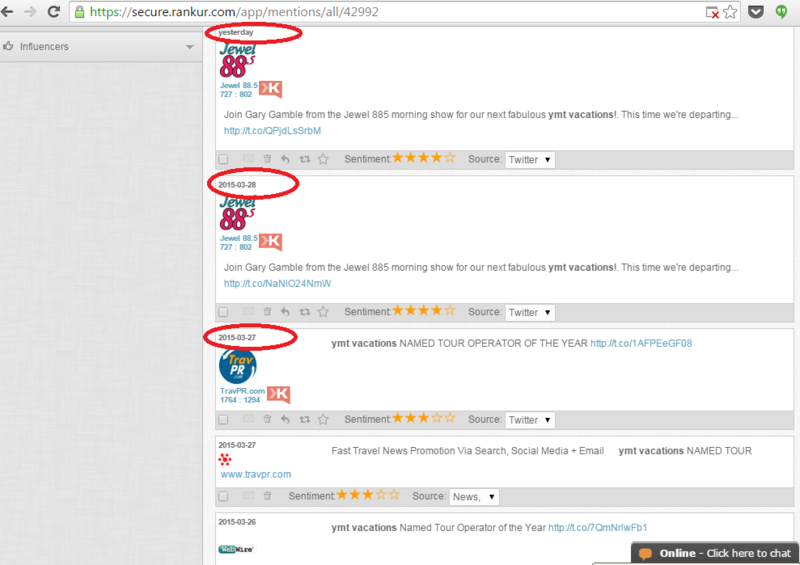 Since Trackur shows two days old results, its number of results is likely to be less than Rankur & Google Alerts. But, one thing is worth noticing here is that when we were studying all these results, our reputation analysts found that Google Alerts and Rankur included some results focusing on ‘vacations’ too, which were apparently irrelevant for YMT Vacations. On the other hand Trackur focused on most relevant results only. Conclusion: Rankur tops the list if we refer to maximum results while Trackur leads the race of quality. Google Alerts fall in between for both quantity & quality. 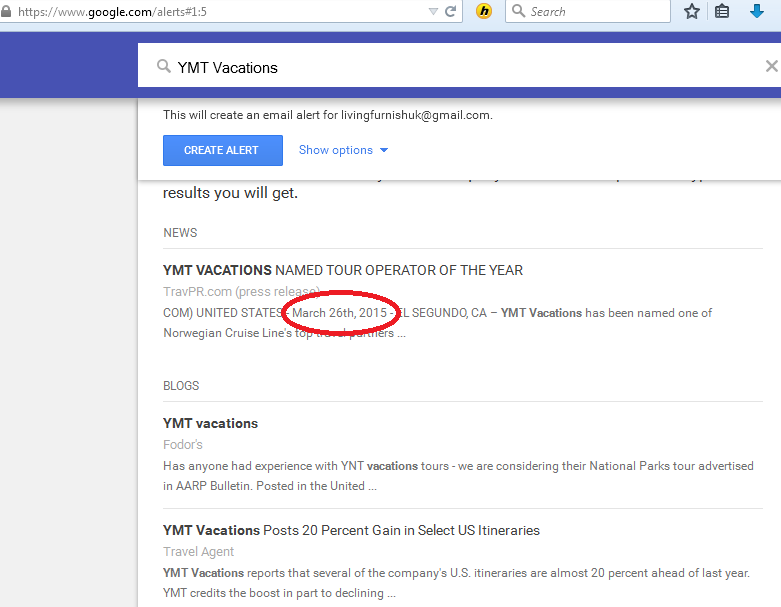 Perceiving the case of YMT Vacations, Google Alerts and Rankur can possibly add match type filters to show high quality results for a key-phrase. 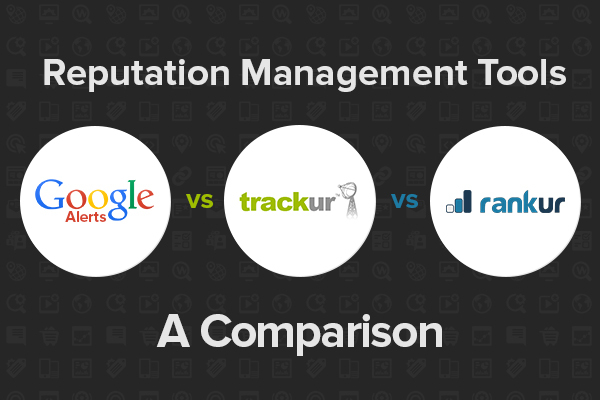 See how Google alerts, Rankur and Trackur make the task of reputation experts simple/complicated in the matter search options. 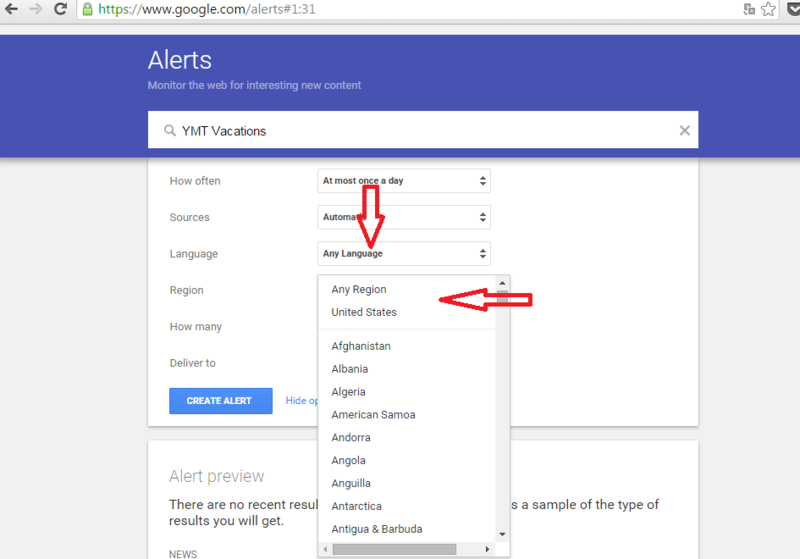 a) All countries option- As you can see below Google Alerts and Rankur tool give enough options to see country as well as region specific results while Trackur doesn’t. Trackur gives us limited country options and makes it difficult to observe global search results (as per the case of YMT Vacations). b) Language Option: Google Alerts and Rankur have more options if you want to see results in a particular language but Trackur sadly lags behind here too. It offers no flexibility for language based results. c) Calendar Wise: Google Alerts & Trackur do not give enough help to sort date wise results while Rankur does. 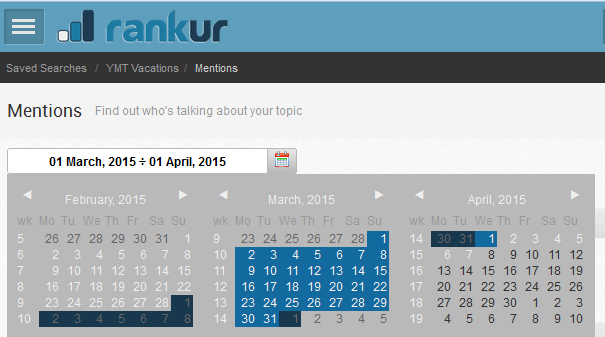 You can see below that Rankur shows us complete calendar and gives the option to filter date-wise results for a brand. Conclusion: On the basis of all results studied for YMT vacations, we found that Rankur has better search functionality as compared to Google Alerts & Trackur. Rankur gives few options that are absent in other two tools. a) Quick Results: Google Alerts delivered results most quickly but Trackur was bit slower. The loading time of Trackur was highest although its number of results was less than that of Google Alerts and Rankur. First time users can feel clueless about processing of results too because it shows no sign of processing and takes long time to load results. Rankur however is better than Trackur but considering the higher number of results that it showed us for YMT vacations in 10-20 seconds, we find it reasonably good in fetching quick results. b) Cleary defined URL without click: We could clearly differentiate between different URLs while searching brand name mentions on Google Alerts and Rankur but in Trackur it was hard to single out links as there were no clearly-defined URLs. Trackur only shows favicons ahead of each result, which do not help differentiate links from varied sources. As you can see below that all images & video based results are depicted with ‘M’ icon regardless of their different sources. c) Report format option: While exporting report from Rankur & Trackur, we had enough options to choose from while Google Alerts did not offer this flexibility. You can get Trackur’s & Rankur’s reports in pdf, excel, RSS feed and word format but Google Alerts gives it in excel only. Trackur has another major drawback in context of user-friendliness. Users can use the free version of it for 10 days only while Google Alerts and Rankur are free to use. After ten days free trial, Trackur prompts you to choose paid version. Considering the latest study of top free reputation management software, we suggest Rankur and Google Alerts for in-depth monitoring of social media sites, negative review sites and other web based results. The results we found while comparing the free versions prove Rankur and Google Alerts more productive for real time monitoring of web results. Possibly the paid version of Trackur may have improved features and show us better results but the question is why anyone would pay for it when Google Alerts and Rankur offer all results for free. To YMT Vacations and similar companies, we suggest tools that can offer quick, relevant and maximum results to monitor their overall web presence. Success of reputation repair and management hugely depends on analysis, based on which we devise unique strategies and fight negative reviews. So make sure you don’t miss out on reputation building just due to poor analysis or wrong selection of tools. Want to know how users look at you as a brand and how they mention about you online? Share your thoughts regarding this post below. Posted in Online Reputation Management, ORM Tools and tagged as best reputation management tool, best tool to monitor online reputation, Free best reputation monitoring tool, online reputation management tools, reputation management tools, reputation monitoring tools by w3Police. 1. 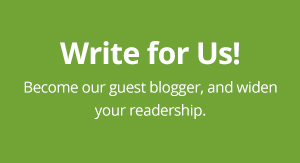 You can use Custom Feeds to add the URL of any review site you wish to monitor. 2. I can’t tell from your screenshots whether you authenticated Twitter or not. If yes, Trackur would have picked up those tweets too. 3. For country targeting, simply select “Custom” and you can refine to ANY country. 4. We do offer full date filtering of your results. 5. Most results load within 20 seconds and if you click the option to expand results, you would see URL, source, snippet, and much more without having to click to the site. 6. Lastly, when your trial finishes you move to our FREE plan. Of course, we would love for you to select a paid plan, but you don’t have to. Thanks again. I hope you’ll consider updating your review with the above info. 1. Going to custom feeds for tracking reviews is little impractical for users. Firstly due to countless review sites available on web as it would take a lot of time to enlist all of them and then add each URL to tool. Every time a new review site appears, the user will have to go back and add the new URL. Tiring, it is. And if, perchance, a site is not added to this list, you always stand a chance to miss a negative review. 2. About social media, we have already mentioned that Trackur shows all results (including comments, threads, updates, posts) whether of twitter, Facebook or other site. 3. We didn’t find full date filtering anywhere while testing results for YMT in free version. 4. While we studied, the results took more than 20 seconds to load and if there are 50 -100 results per page, it’s unfeasible to click each result to check URL, source, snippet while other tools make it more feasible to observe overall results by showing URLs without clicking through results.